Hear how ESG defines "tier-1" storage in the modern IT world and in the data centers and services that support it. What was a simple environment just a few years ago with mainframes or a few large servers to be supported has evolved into a complex web of virtual machines, clouds, and expanding user expectations -- factors which demand and create flexibility, but do so in a way that pushes a lack of predictability upon the storage infrastructure. 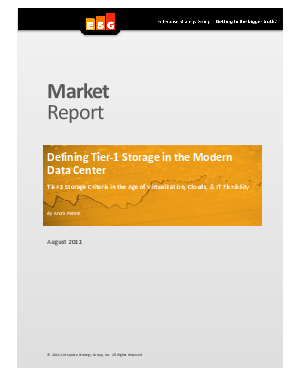 Learn what your criteria should be for tier-1 storage.